AshleyNewell.me: All Things Unity: Alter It! All Things Unity: Alter It! Hi friends! I hope you're all having a wonderful weekend! We are doing really well over here! YAY! I love it! 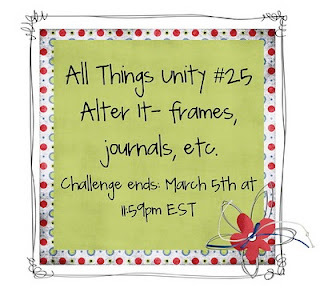 Today, I have a new All Things Unity challenge for you! It's a super fun one too! It's "Alter It." You can alter anything you want ie frames, journals, etc... All you have to do is alter an item using Unity or Ippity stamps. There's a huge prize this month! It's a 2011 February KOTM! Woohoo! I wish I could win! That's a fabulous prize! So, be sure to link up your creations on the All Things Unity blog!! Here's my project for this week. I actually already bought this frame before I knew about this challenge because I was gonna alter it for the Unity Co-Brand challenge but I didn't get around to it. I think I might want to make it a little more decorative but I'm not sure. 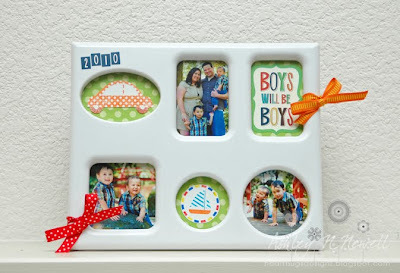 I had a vision of making a frame for my boys with some Echo Park Little Boy. How perfect are these stamps and this paper?! Seriously, even the colors matched the kids's shirts. Be sure to check out the DT to see what they made too! What a great altered frame. Love all the pics too. Thanks for the inspiration. LOOOOOOOOOOVE this frame--esp. the pics--forget the stamps;) LOVE those family pics! Great job to your photographer! And great job to you--love the added ribbon! SUPER ADORABLE:) LOVE LOVE LOVE!!! your frame is adorable and what a great buy it was:) your family is darling, ashley! Your frame came out SOOOO cute!! You're right, the colours in the EP paper matches perfectly with their little shirts! You seriously have the best photographer ever! Of course, it doesn't hurt that Parker and Brady are so darned photogenic! !